AIKIDO is an effective, yet non-violent, traditional Japanese martial art. AIKIDO was developed by Morihei Ueshiba (1883-1969), a Japanese philosopher and master of kendo, spear-fighting, and jujitsu. 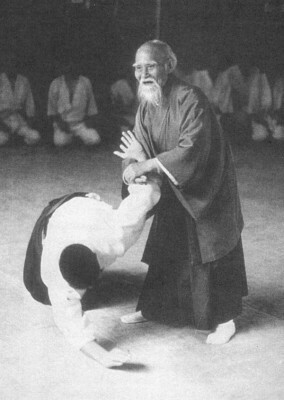 O'Sensei (great teacher, as we refer to Ueshiba) was disillusioned with the endless cycle of violence and competition in the martial arts, so he designed AIKIDO as a discipline of personal refinement. Master Ueshiba taught the aikidoist to move with, rather than against, the attacker by drawing on our internal energy, or "ki". Ones goal in AIKIDO is to redirect the opponents' energy and neutralize an attack without harm. AIKIDO is non-competitive, taught in a cooperative manner, good exercise, and fun! The Coastal Aikido Center is dedicated to uniteing the ideas of both the USAF, and the TAA, while maintaining the integrity of the lineage of both styles.